A total of 37 youngsters received a lot of information on water production in a presentation by WEB N.V.
Kralendijk – In connection with World Water Day, the Public Library last held an information day on the water production presented by WEB N.V.
Educational information was given to Preschools Dopey, Noon School Antriol and T & TMC (Talk Talk & Activities Activities Multi Discipline Center) of the after-school care. 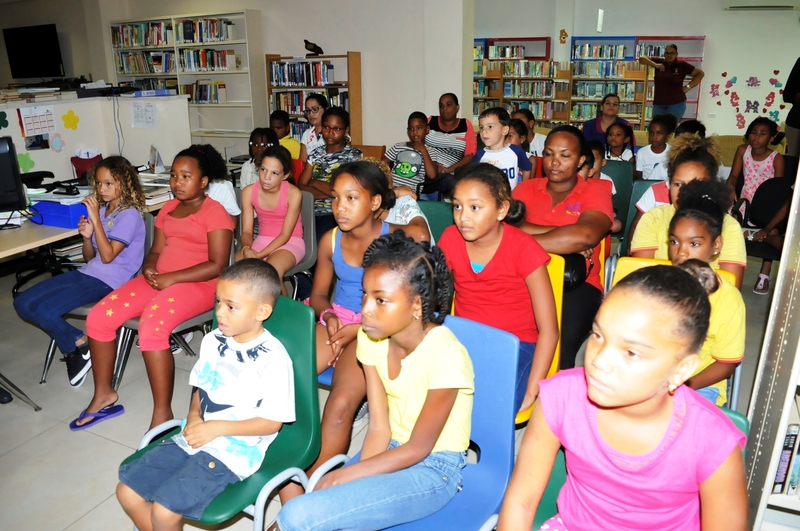 The children were welcomed by Mrs. Dorothy Cicilia Public Library who then gave the floor to Ms Pamela Paz and Mr. Pascual Jovenacosta of the Water and Electricity Company Bonaire (WEB) who explained to the children how the WEB produces water. By means of a video which lasted for 4 minutes the children were shown how the process of the purification of water takes place. The children were very happy with the video instruction and they could ask questions to Mrs. Pamela and Mr. Pascual, who answered all the questions. Finally, all 37 children received a gift as a token of appreciation from the WEB SA.